Why do we love Sicily? Check out our new Drone movies! We have been dreaming about having a drone for a long time now and finally another dream came true! The wind is on here -as always-, so we don’t have much time to fly it, but as soon as we do, we use it to make unforgettable memories for our guests. We try to capture them while doing their first few meters on the board or riding upwind and learning to turn or jump for the very first time. So, first of all, check our spot and Geri while having fun in the empty lagoon. Even for a big guy with 100kg our 17m2 RRD PAssion was more than enough in 10-12 knots. We are one of the last schools in the lagoon, thanks to that it is uncrowded and perfect for practising. The bottom is sandy, only a few rock here and there. We have a big area with very shallow, perfectly flat water and a slighlty deeper downwind where you don’t have to worry about crashing at all. It is one of the best parts of the whole lagoon for kitesurfing! Come and learn to kitesurf with us! Thanks to the easy conditions on our spot, it is very easy to learn kitesurfing! Our goal is to bring all our students fast to a level where they can practice safely independently! The following shots are made of a couple who started to kitesurf with us and after 2-3 days they were able to ride both directions and we could just let them to practice alone (with radio helmets). Kitesurfing is easy you just need good conditions for it! We have many guests who already did some kitesurfing in Fuerteventura or Tarifa or various locations in Greece. They had 10-15 hours behind their back and still weren’t able to ride longer distance. 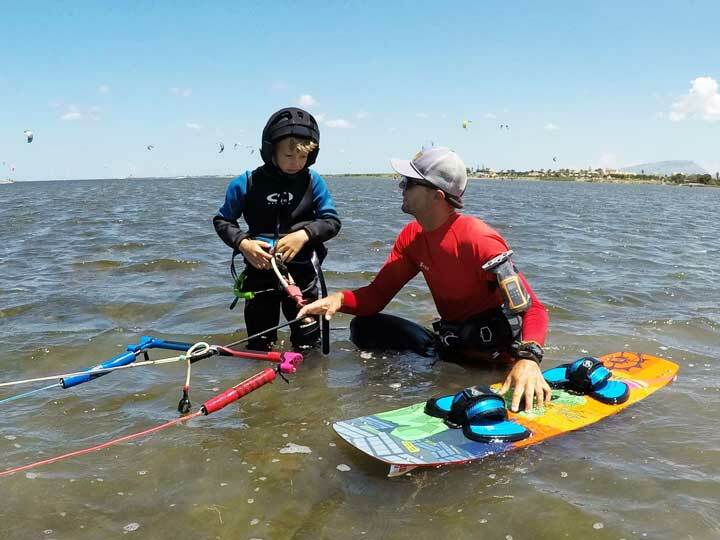 After 1-2 hours here with us, they were able to finally enjoy kitesurfing and spend more time on the board riding than upwind bodydragging for their boards. 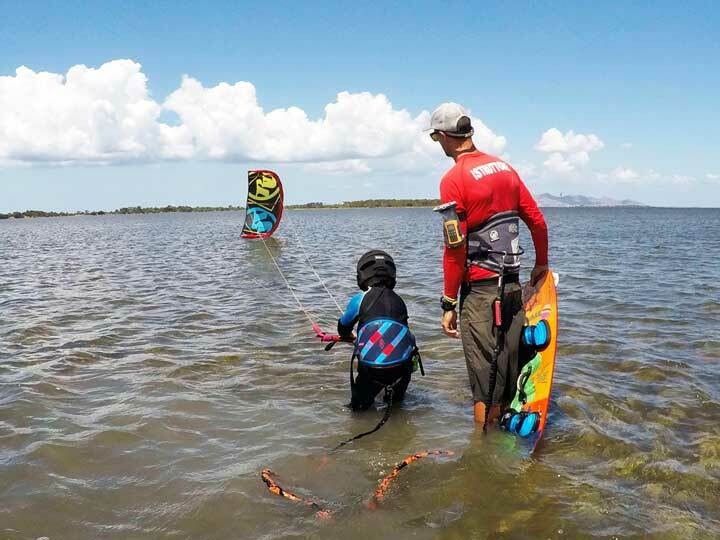 There are not many places in Europe where children can learn easily kitesurfing but Lo Stagnone, Sicily is one of them! 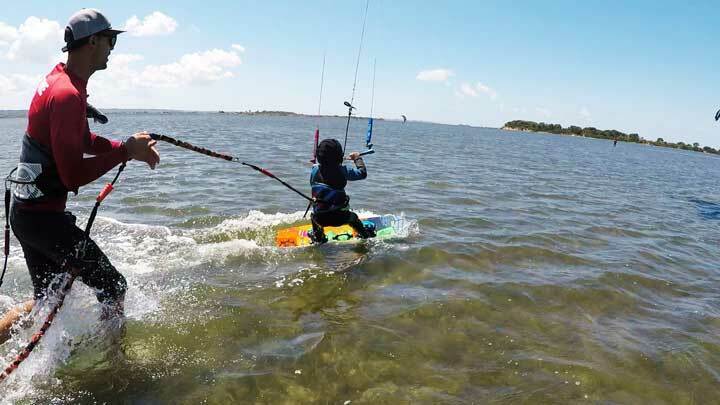 In this shallow water and with our special equipment many children have learned kitesurfing with us already. Easy to walk even for them, so they don’t get tired soon and they are able to concentrate on the task for longer.